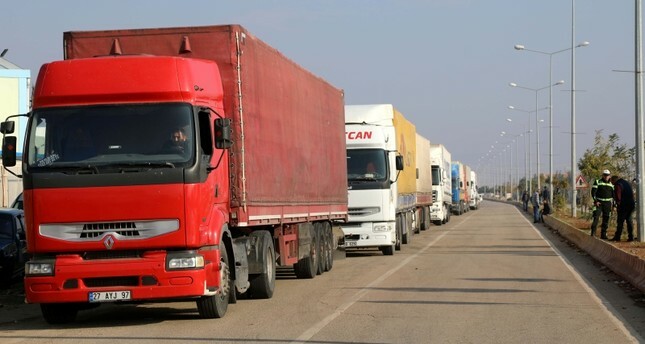 Turkey has officially opened a new border crossing to the northwestern Syrian city of Afrin to speed up the delivery of humanitarian aid there, and it has been operational since November 8, Trade Minister Ruhsar Pekcan said Friday. Pekcan said that the gate would be named "Olive Branch" after Turkey's cross-border counterterrorism operation which was launched on Jan. 20 this year. Turkey's Customs and Trade Ministry and the Hatay Governor's office in southern Turkey previously announced that they had agreed to open the gate near the village of Hamam in Kumlu district. Turkey currently has 10 land and three rail customs gates with Syria. As of November 2018, only one rail and four land crossing are operational. The village is located near the town of Jandaris in Afrin district, which was liberated by Turkish Armed Forces (TSK) and Free Syrian Army (FSA) fighters as part of Operation Olive Branch launched on Jan. 20 to clear PKK-linked People's Protection Units (YPG) and remaining Daesh terrorists from the area. Turkey shares a lengthy border with Syria, where the lingering conflict left Turkish borders vulnerable to attacks. As the People's Protection Units (YPG), a group linked to the terrorist group PKK active in Turkey, grew in strength in Syria's north and threatened Turkey, Ankara took action in January by launching the operation to aid the FSA to take over Afrin, a stronghold of the YPG. Turkish authorities stepped up humanitarian support to civilians in the town of Afrin after it was liberated on March 18 by Turkish-backed forces as part of Operation Olive Branch.